Would you like to take your leadership skills to the next level? The Tallahassee Leadership Academy (one-year program) for professionals includes a full year (12 progam months) of leadership curriculum, mentoring, coaching, assessments, and evaluation. Class size is limited to 12 participants for a group coaching environment. Apply today to join the 2020 Leadership Academy! The first class reported a a 50% increase in their leadership skills as a result of what they learned! On a 1-10 scale, 10 being the highest, they rated their leadership skills as a 6.2 in the begining of the academy and a 9.2 after the year of learning. Check out the current Leadership Academy schedule for details. For more information, contact Dr. Gabrielle K. Gabrielli at 850-321-8222 or via email at gabrielle@gabrielleconsulting.com. 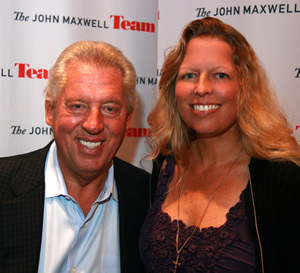 We are excited to be a partner with leadership guru Dr. John C. Maxwell. Dr. Gabrielle K. Gabrielli covers many of John Maxwell's books including Everyone Communicates Few Connect! Mastermind groups, seminars, workshops, and free lunch and learns are offered. Imagine several weeks of in depth knowledge about search engine optimization, digital marketing, social networking, analytics, and more! The 4-part series course in Digital Marketing is very popular because our students are able to quicky implement strateges. As a supplement to the series, a 3-hour course including social media was offered recently. The next session will occur in fall 2017. Contact Gabrielle for questions or register online. Are you a new iPad or iPhone user, or if you've had one a while, do you wish you knew more about them? Gabrielle teaches "iLearn iPhone and iPad Basics Seminar". Cost is just $30 and includes lunch, discounted to $25 for Tallahassee Chamber of Commerce members. Our next planned teachings and presentations include the following. Those open to the public are marked as such. Contact Us if you have questions about any of the courses or feel free to view our calendar including details of scheduled events open to the public. The Tallahassee Leadership Academy (one-year comprehensive program) for professionals that includes a full year (12 progam months) of leadership curriculum, mentoring, coaching, assessments, and evaluation. Class size is limited to 12 participants for a group coaching environment. Apply today to join the 2020 Leadership Academy! Everyone Communicates, Few Connect: What the Most Effective People Do Differently. Tallahassee Community College, April 2019. Power Up: Launch Your Dream Seminar. TBD 10:00am-4:00pm. Open to the public. See more details and register online. Leadership Seminar: The 15 Invaluable Laws of Growth: Live Them and Reach Your Potential. Date TBD. Register online. Leadership Mastermind Course (6 weeks) on Everyone Communicates Few Connect: What the Most Effective People Do Differently. Next Date TBD but likely spring 2019. Register online.